Red-crowned cranes have emotions as intense as ours – and nobody knows it better than photographer Masahiro Wada. 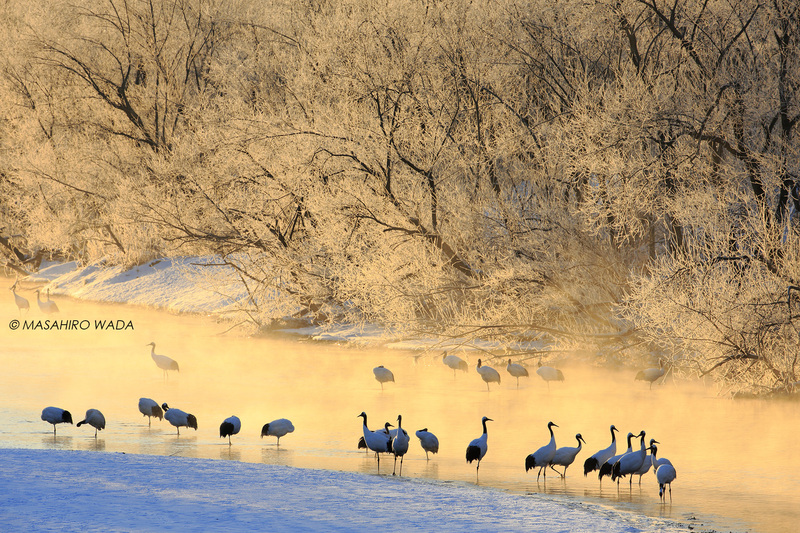 To Wada, red-crowned cranes are not merely birds but our fellow creatures. Here Wada shares some fascinating stories about red-crowned crane families. Back to the Roost I often hear that red-crowned cranes form very strong pair bonds, but the truth is that even pairs of red-crowned cranes can break up. The lives of red-crowned cranes center around their young. Eventually the juvenile cranes become old enough to leave their parents, but some parent birds will not readily part with their young. In cases like this, the other parent will leave to find a new mate. To put it another way, when red-crowned cranes are able to let their young go, they form a pair bond for life. It all comes down to their young. When you think about this, you can understand why Wada says "Red-crowned cranes do not act like birds". Young Cranes Leave Their Parents Evening has come to a peaceful farm road, where there is almost no sign of people except for the occasional tractor. Two bonded pairs of red-crowned cranes and two juvenile cranes (cranes that have not yet left their parents) walk with their parents to their feeding ground. Red-crowned cranes take around three years to reach adulthood, and spend the first 10 months after hatching in April or May with their parents. In around February, they are ready to leave their parents and live alone. Young red-crowned cranes find a mate at around two years of age and then reach full maturity at the age of three. This photo captures a moment before young cranes leave their parents and set out into the big world alone. 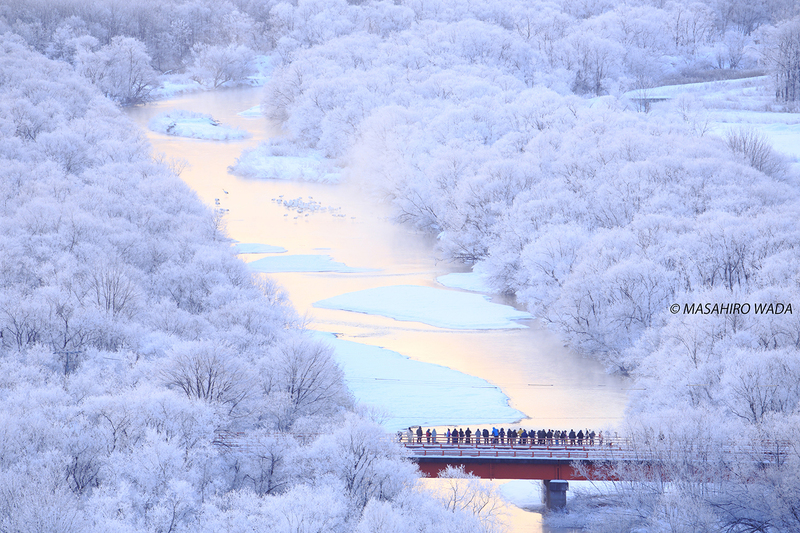 Born in Tsurui Village, Hokkaido in 1956, Masahiro Wada began photographing red-crowned cranes in 1968 and held his first private exhibition, Tancho no Shiki (The Four Seasons of Red-crowned Cranes) in 1985. 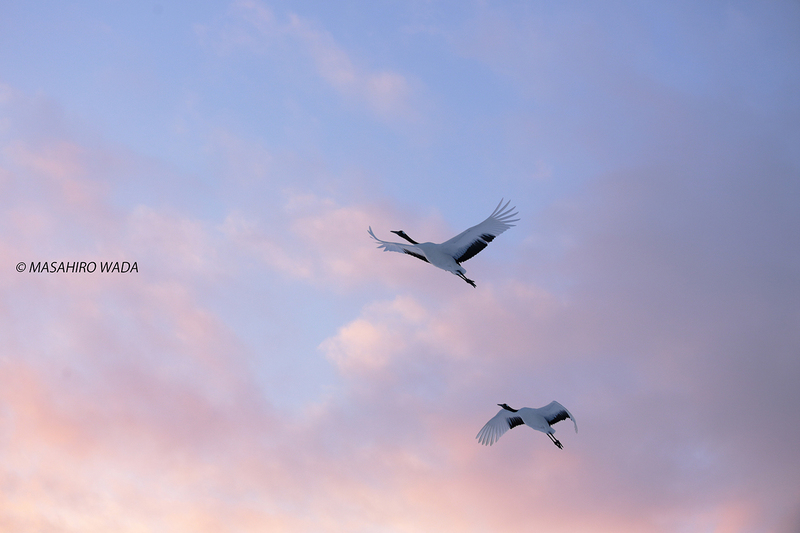 Since then, Wada has actively held exhibitions of red-crowned crane photos both inside and outside Japan. In addition to his professional photography, Wada opened Hotel Taito in Tsurui Village in 2000. Designed for nature lovers, Hotel Taito is a place where enthusiasts of outdoor activities, photography and other nature-related pursuits can share their passion. There is also a mini gallery of Wada’s photography works. Wada has published multiple photo collections including Kita no Daichi Tancho (Northland Japanese Cranes), and is a member of the Japan Professional Photographers Society.